by St. Theophan the Recluse 312 pgs. 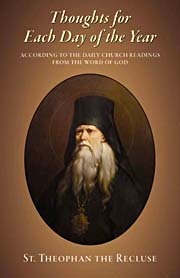 In the present book, Thoughts for Each Day of the Year, St. Theophan takes us through the yearly cycle of Gospel and Epistle readings, humbly and reverently offering us brief but powerful daily meditations on the word of God. He also addresses the problems of his day?lack of faith, coldness of heart, trust in the rational mind rather than in the revealed Truth of God?which are problems of our day as well. Contemplating the sacred texts together with St. Theophan, the reader will learn to penetrate more deeply into Holy Scripture, and will receive answers to many dogmatic, moral, and spiritual questions which touch upon our salvation. Thoughts for Each Day of the Year can help us to more closely connect our lives with the life of Christ in His Holy Church, and to gain a better knowledge of how to fulfill His commandments.